Noise-induced hearing loss is a common disability for many people who work on construction sites, in manufacturing facilities, in factories and printing presses. Although OSHA has established allowable exposure levels, and safety equipment exists to protect workers, hearing loss continues to occur because of willful safety violations or catastrophic accidents on the job site. Have you suffered hearing loss due to inadequate hearing protection being provided by your employer? At the Illinois law offices of Goldberg Weisman Cairo, we are the chosen legal counsel of many union workers and tradesman and can bring the experience that we have gained from more than 30 years fighting for the rights of the injured. Don’t delay. To speak to one of our skilled lawyers call us today at 1-312-464-1234 or reach us online via our 24/7 live chat. Your first consultation is free and we only get paid when we obtain a recovery on your claim. Construction workers can lose hearing in two ways: long-term exposure to noise above 85 or 90 decibels, or sudden exposure to extremely loud noise (an explosion). Some forms of hearing loss can be reversed; some lead to permanent tinnitus, hearing distortions or outright deafness. If you are suffering hearing loss or deafness and you suspect it is related to your work in the construction industry, the Chicago injury attorneys at Goldberg Weisman Cairo stand ready to help. Every one of our 33 injury lawyers has a solid working knowledge of construction. We understand your job and the risks you face. We are prepared to gather the evidence and to access the medical experts needed to prove your hearing loss was the result of your working conditions. Contact our Chicago law office for a FREE initial consultation today. The U.S. Occupational Safety and Health Administration (OSHA) has established safe levels for noise exposure. Over the course of eight hours, the legal limit of noise exposure is 90 decibels, and yet studies have shown that a third of all construction sites are above that level. (Even 90 decibels is problematic as long-term exposure to noise over 85 decibels is harmful.) It’s not uncommon for workers to be exposed to decibels of 115 or more. It’s inevitable that workers using chop saws or skil saws, roto-hammers and chipping guns are going to be exposed to excessive noise. Protective gear with a noise reduction rating (NRR) can be effective in protecting workers’ hearing. While some workers may balk at wearing earplugs or earmuffs because they are less aware of activities going on around them, clear standards and enforcement efforts set the tone for a safe job site. 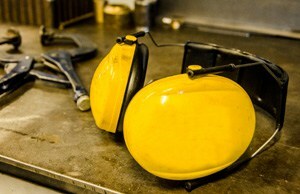 Employers who fail to warn or counsel workers about the use of hearing protectors may be found in violation of OSHA standards and may be liable for hearing loss and other injuries sustained by their employees.